Organizing regional and national gatherings create support spaces for LGBTQ youth organizers to engage each other as peers, leaders, and solution-makers, to share skills and to deepen relationships. Through these various convenings, we aim to support the leadership of LGBTQ youth to do more direct action organizing, support the capacity of peer allies to organize among themselves, and broaden a national network of LGBTQ youth organizers. Since 2009, FIERCE has organized four national gatherings and two regional gatherings. In addition, we have utilized other national movement spaces like the Allied Media Conference, US Social Forum and the National Gay & Lesbian Task Force Creating Change Conference to convene queer and trans and organize spaces to share experiences and build and learn together. From December 10-11, 2013, FIERCE convened nearly 30 LGBTQ youth of color and adult allies from 9 youth programs across the northeast for our Move Up, Fight Back Northeast Regional Convening. 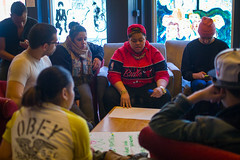 The groups included the Attic Youth Center, FIERCE, Global Action Project, Youth Power Project and GLOBE from Make the Road NY, Out Now, the PRYSM (Providence Youth Student Movement), SMYAL (Supporting and Mentoring Youth Advocates and Leaders), and Streetwise & Safe. To sign up for updates about future summits or movement building opportunities, email national@fiercenyc.org. Calling LGBTQ Youth of Color in NYC: Join FIERCE Today! The Rebellion Is Not Over!